If the Sheriff says the territory is to treacherous, then.....Where are the Drones for missing Brandon Lawson? 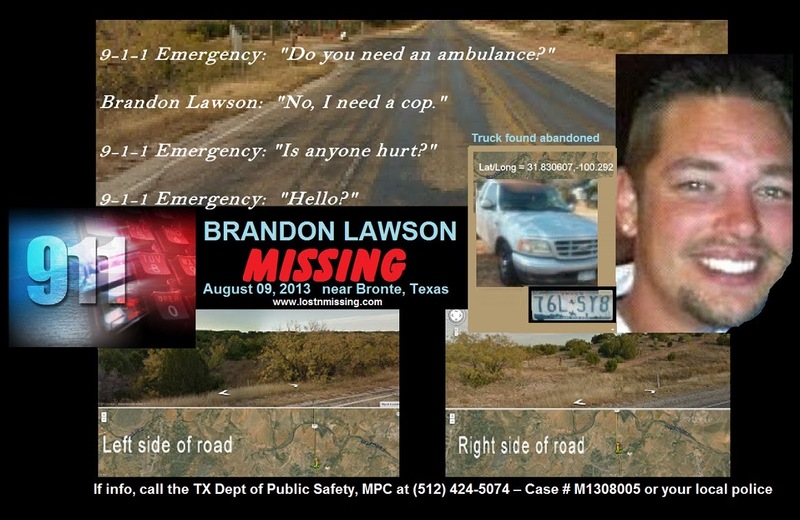 *****************************CIRCUMSTANCE**************************** Brandon Lawson, an oil field worker and father of four, was last seen when he left his San Angelo home on August 8, 2013 at approximately 11:53 PM after a spat with his common law wife, Ladessa Lofton. Wanting some cooling off time, Brandon phoned his father and set off to his home. 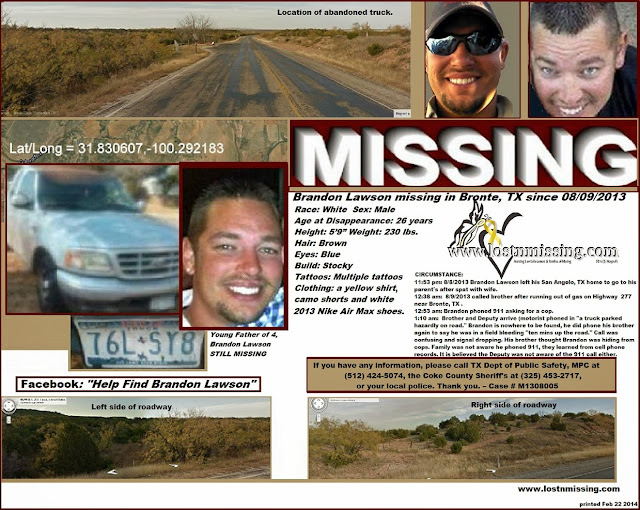 While enroute, he called his brother, Kyle, for help after running out of gas on Highway 277 near Bronte, Texas. Kyle, and his girlfriend Audrey, phoned Ladessa to tell her that Brandon ran out of gas and he needed their gas can. Ladessa told him she would leave on the porch as she was heading to shower and bed. Kyles's check did not clear in his bank account so he had no money to fill the gas can but figured when he got to Brandon with the can he would drive him to Stripes Convenient Mart and Brandon could pay for the gas...and he would drive him back to his truck and he and Audrey could be on their way back home. What is known next is that following his phone call to his brother, something happened and Brandon phoned 9-1-1 — telling dispatch he was "in a field" and needed help and that he needed a cop. The dispatcher heard Brandon say "I ran into somebody" and responded to him , "Ahhh, ran into them? Ok." Another call was made to 9-1-1, by a passer-by (Trucker) regarding Brandon's truck parked crooked on side of the road, posing a hazard. When Kyle arrived, at 1:10 am, August 9, 2013, there was no sign of Brandon. A Sheriff's Deputy arrived at the truck at the same time as Kyle and Audrey. There was no visible damage to Brandon's truck and his keys and his cell phone were gone. It is understood that the Deputy, nor Kyle, were aware that Brandon phoned 9-1-1 asking for "a cop" as well as stating, "please hurry!" While talking with the deputy, Kyle received a call from Brandon, in which Brandon's cell was going in and out and he was hard to understand. What Kyle understood was "I'm in the field." Kyle, felt maybe Brandon was hiding in the field due to an outstanding warrant from 2 years ago (that Brandon himself just learned and was going to address it the following week) so Kyle made no mention to the deputy of Brandon being the phone call he was listening to. 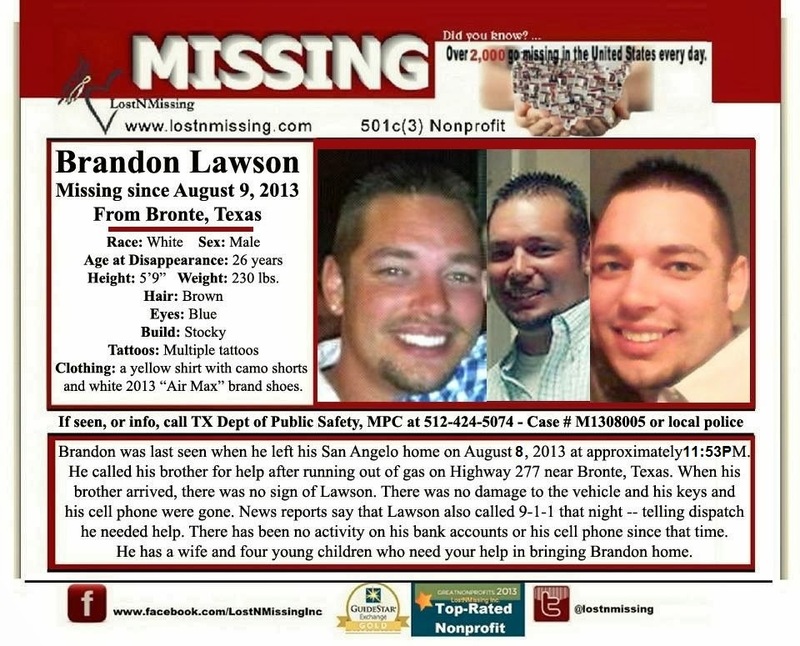 Had Kyle known Brandon phoned 9-1-1 he would never have assumed his brother was "hiding." At 1:18 Audrey texted Brandon saying "A cop is at your truck" it is assumed she did such as she wanted to warn him due to his warrant. At this time they were not aware that he himself phoned 911 asking for a cop and to please hurry. In statements given to police, as explained by the family, they did admit Brandon's earlier call to them in which he told his brother, and Audrey, that "he was ten minutes up the road, and was bleeding." This was also not reported to Deputy Neal at the scene. It is also understood that Deputy Neal did not report to Kyle that Brandon phoned 911. (It's still unclear if Deputy Neal even know if Brandon called 911) From all media reports written by The Observer Enterprise, owned by the Sheriff and his wife, that the 911 call was only reported as " a stranded motorist who ran out of gas." No mention of the urgency nor any mention of "I ran into them"( as understood by the dispatcher) The Deputy put emergency flashers on , locked the truck and proceeded to "leave the scene" and arranged for a tow in the morning. According to reports the Deputy drove up and down the roadway to see if he could spot Brandon walking. Kyle and his girlfriend left the empty gas can in the bed of the truck thinking if Brandon came back he would have the can and could retrieve gas. They began to go look for him. When morning came, and still no sign of Brandon, Kyle's money was available in his account and he went back to the truck and filled the can and returned it to the truck. At this point he was now starting to become concerned and felt that Brandon may not have been hiding and may be in trouble. In talking with Investigators he now gave them the full account of Brandon being on the phone at the time the Deputy was at the truck. It wasn't known by Brandon's family that he called 9-1-1 until Brandon's common law wife, Ladessa, saw on the itemized cell phone transactions, provided by law enforcement, that a 9-1-1 call was made. 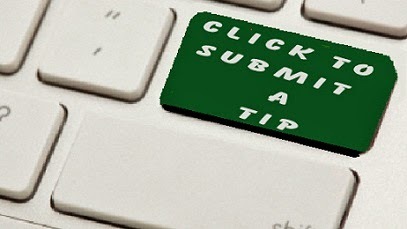 There has been no activity on Brandon's bank accounts or his cell phone since that time. An extensive search was conducted by professional Search and Rescue on October 24, 2013, around the area of the abandoned truck. Any updates in 2017? 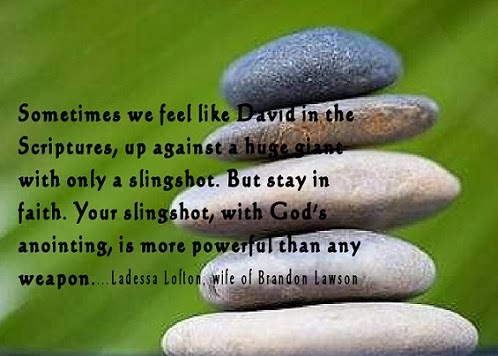 Prayers for Brandon. The local media is the key to motivating LE. From what I understand the local media (newspaper) is owned by the sheriff!! Not good. They need to get a Dallas or Abilene station on this. Could we start a petition to get a drone search?? I know I would sign. I know many who will sign it. It's now 2019. Is there not any more updates to this story at all??? I agree. 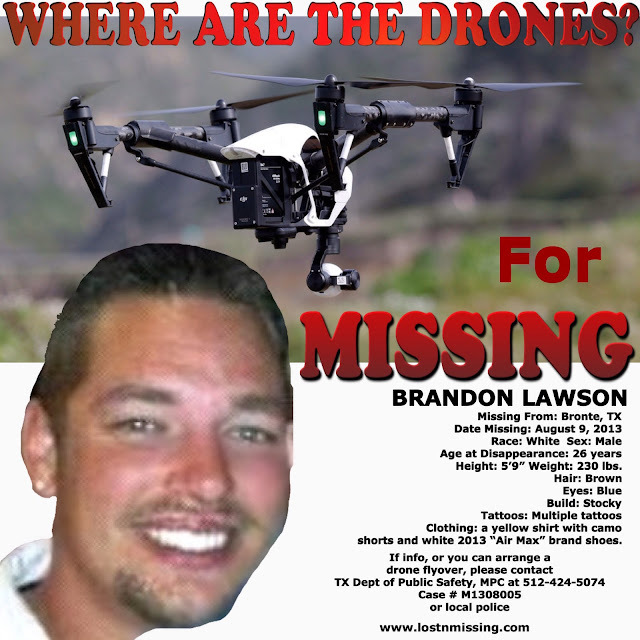 Is there a petition for a drone search? I would also sign and get others to also. I'm from Nashville Tn and spreading his story.